When you phone or email us for Subaru parts we will nearly always ask you for your Subaru model or vehicle chassis number, so what is this information and where can you find it? What we need is the information off the Subaru chassis tag, we don’t want the VIN number off your registration or ownership papers. So where is the Subaru chassis tag, what does it look like? 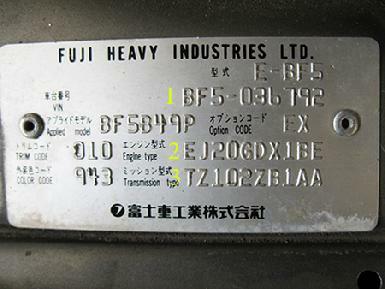 If you open your bonnet and stand in front of your Subaru the chassis tag is located on the passenger side suspension strut tower, it has the name FUJI HEAVY INDUSTRIES LTD on it, as you can see in the photo below. 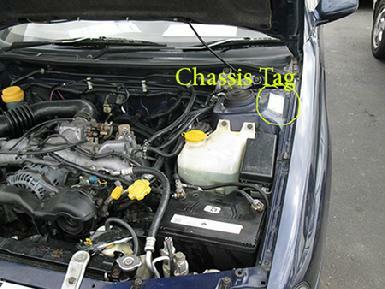 So now you know where the Subaru chassis tag is located and what it looks like, what information will we ask you to give us? The first row (yellow number 1), this is the model or chassis number we may ask you for, it tells us exactly what model your Subaru is. The third row (yellow number 3) is the transmission type, this will tell us if your Subaru is automatic or manual and also tells us what the transmission ratio is for your vehicle. So that’s about all the information we will need to make sure that we quote or supply you with the right Subaru part for you car, if you are still not 100% sure of how to find your chassis tag we’re just a phone call away and would be more than happy to help!